Sushi never looked so good! 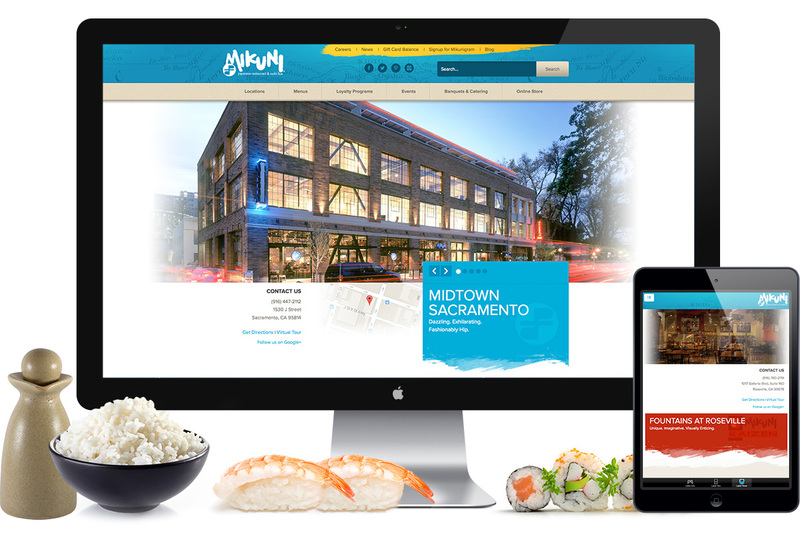 Mikuni came to us with the vision of translating their web traffic into foot traffic at their many Sacramento restaurant locations. Mikuni is a staple sushi restaurant for most local Sacramentans. Being asked to bring their website current was both terrifying and exciting! One great thing about Mikuni is that they have the photography (and sushi chefs) to back up their high-end brand and delicious sushi rolls. The first step was an on-site visit, because we never shy away from a reason to enjoy a delicious sushi lunch. The second step was to trigger a custom photo shoot of both new and classic sushi rolls, as well as their ever-changing fresh fish and noodle dishes. We know the history and love the brand. Great projects start with an understanding of the brand and the small idiosyncrasies that come along with them. For Mikuni there are two main faux pas most commonly made when working with their brand. First, do not call them Mikuni’s. There is no “s” in Mikuni. You wouldn’t call it Burger King’s, don’t call it Mikuni’s. Second, don’t mess with the logo. Some companies like their logo broken apart and used in different ways. Mikuni likes their logo whole. We know these things, we embrace these things, and it makes the project even more successful when two organizations are invested in the brand. We wanted the Mikuni site to create a competitive and dynamic atmosphere in the office. 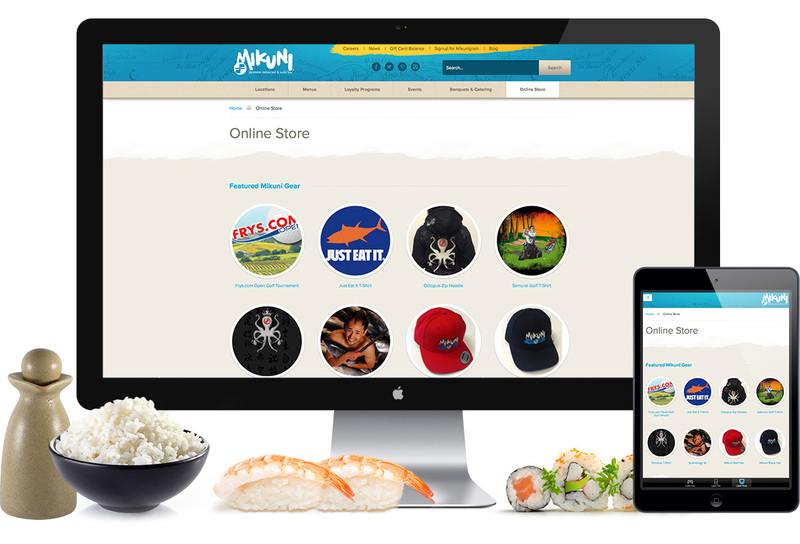 Our solution: Put a $100 gift card for Mikuni on the line and put both designers on it. The result was two different design solutions, both of which were presented to the client as options. Mikuni ultimately combined them, but did decide on a winner. The winning designer was awarded $100 of delicious sushi and our project was underway in style! 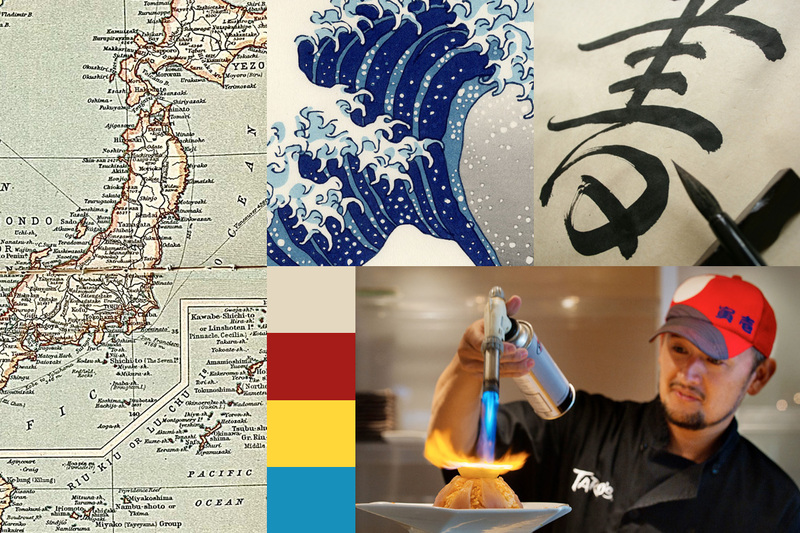 Along with the Mikuni brand comes the Japanese culture people seek when dining with Mikuni. The final design combined inspiration from ancient Japanese prints, colors, lettering and maps. This resulted in a site that combines old world feel with new world technology. 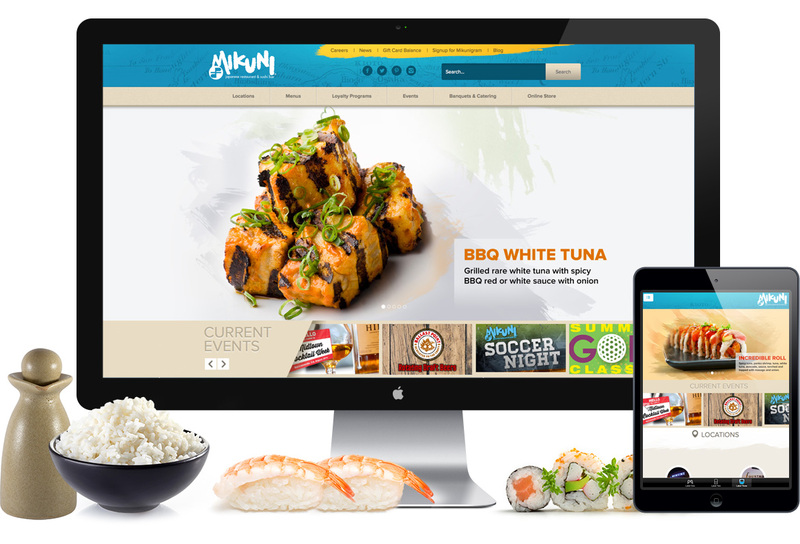 It also brightened the Mikuni brand and created an engaging platform for users to dig through locations, menus, photos and more. Cooking up a new Mikuni. Digging into the Mikuni analytics from the last few years helped drive a new navigation structure. Locations moved to the front, followed by menus and loyalty programs. 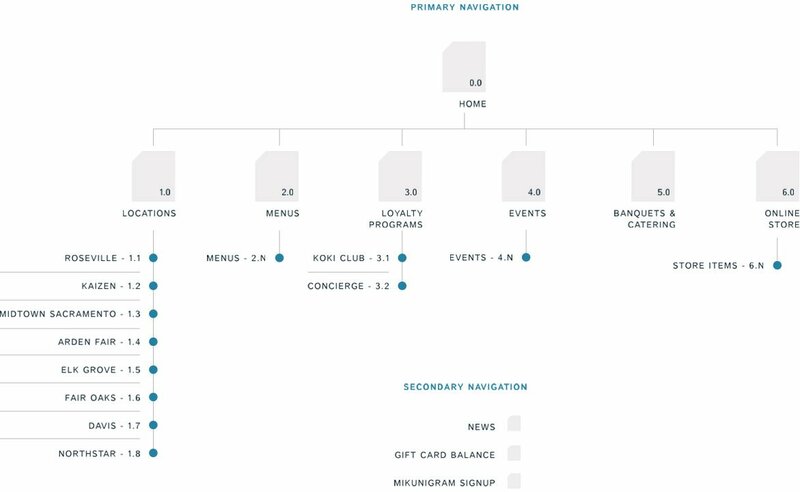 Search terms and Mikuni goals were factored into a final sitemap that was flexible and editable. Start with structure; it’s much easier that way. Balsamiq is more than a dressing; it’s an amazing wireframing tool that we love! And because Mikuni wanted to focus the new site on food and locations, we used Balsamiq to craft pages with large and engaging photos and easy to find location data. Mikuni isn’t a typical restaurant – they have tons of dynamic information and a die hard fan base. The new site had to layout the information in a way they could easily find it. Starting with the structure made that goal much more attainable. 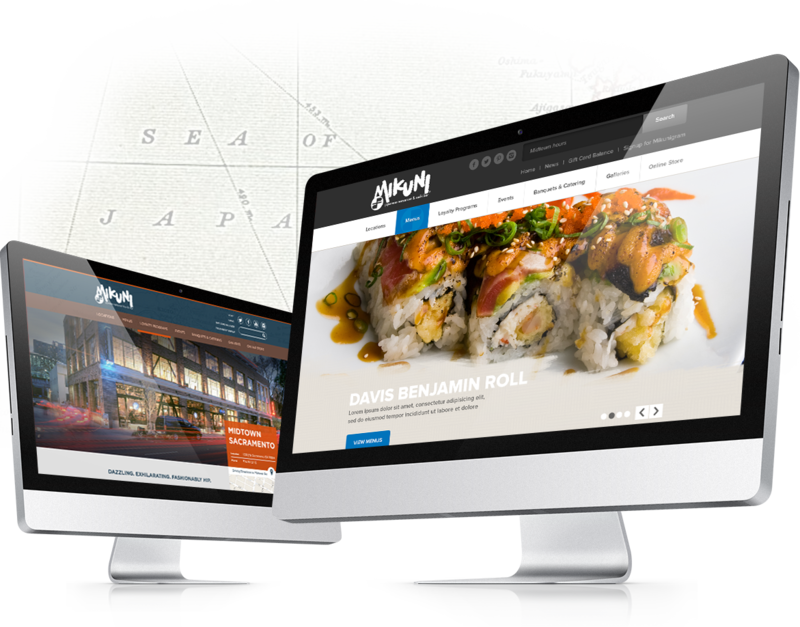 The new site is bright, vibrant and easy to use…everything a top-tier sushi restaurant should be. The Mikuni Powers-That-Be were unbelievable fun to work with and we’re proud of our collaboration. Sounds like it’s time to celebrate at Mikuni! 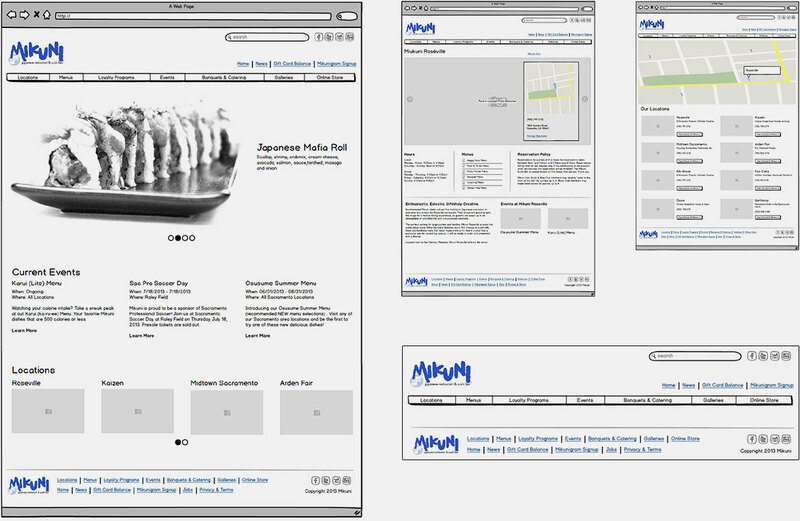 Back in 2005 when I first started working with Jeanne Mabry at Mikuni I never would have thought that I'd see 4 different iterations of the Mikuni site in 9 years. The shelf life for a website in today's market is 2-3 years, tops. Technology changes so rapidly that companies should be changing their sites this often. The Mikuni site that this new one replaced was almost 5 years old. It was a dinosaur and it was time to change. That change was nerve racking to say the least. In previous redesigns we always worked with Jeanne directly; we didn't sit in a board room with all the Mikuni managers and owners. This time, things were different. Our initial design presentation included over a dozen people at varying levels of management/ownership. My first thought was "too many cooks" but it turned out to be the best-case scenario. Each person brought their own spin on what we presented and ultimately helped create a better product. While I think the first two versions of the site we designed are nice, I can say with total certainty that the final design, the result of over a dozen people talking things out, is better. Mikuni is a local sushi staple and it's an honor to have them as a client. They push Three29 to be better with each project we touch and that's something we deeply value with our partners.